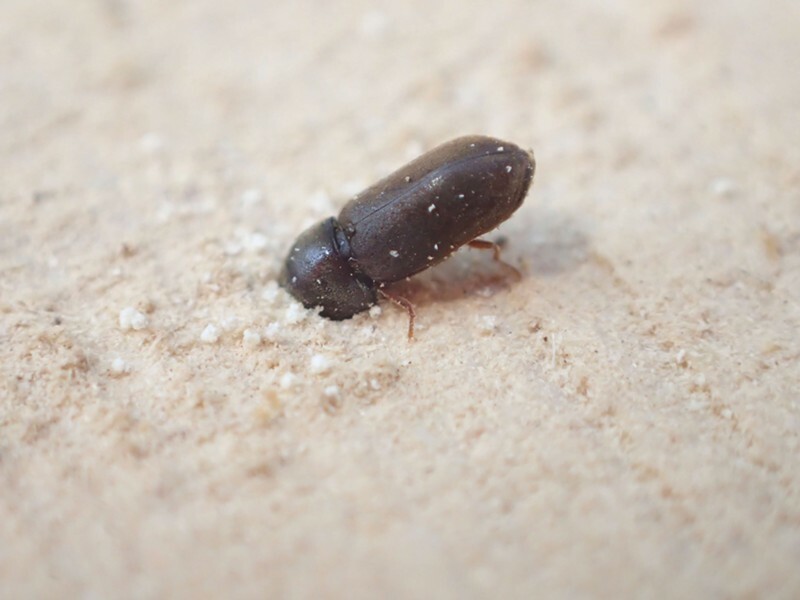 A 4 millimeter-long beetle was persistent and despite being shooed away several times repeatedly returned to its excavation. Yesterday was a day for beetles. Moving some large pepperwood planks to my garage for curing, I noted several small beetles on the freshly sawn surfaces. One was actively chewing its way into the surface. There are quite a few species of small cylindrical wood boring beetles, many choose a single species of host tree. At about 4 millimeters long this one makes holes about 2 millimeters across and seems particularly fond of pepperwood. I noticed several “shot holes” already in the wood. I am not yet sure how I will deal with the insects that have already invaded the wood I intend to use for countertops. Tiniest beetle I've seen so far. Probably attracted to fungus invading felled wood. 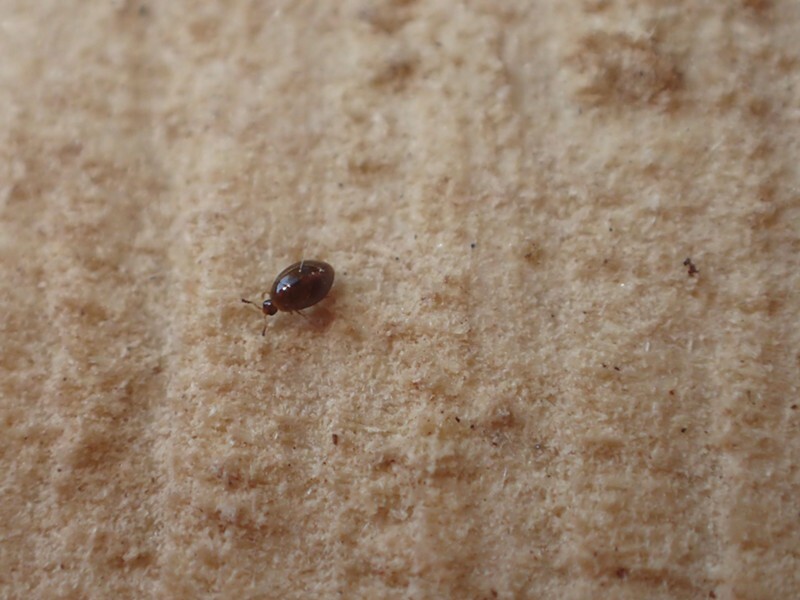 Some time ago I reported on the tiny feather winged beetle I'd caught, and that it was a member of the family containing the smallest beetles in the world. Well, I found one even tinier than that specimen. Smaller than the period at the end of the sentence, at first it looked like it might just be a speck of dirt, but it moved in a purposeful way so I took a magnified photo. Only after I downloaded the image could I make out any details. The tiny dot was a beetle. Although it has been tentatively identified as a spider beetle, I'm not sure that's correct. I'm still working on it. 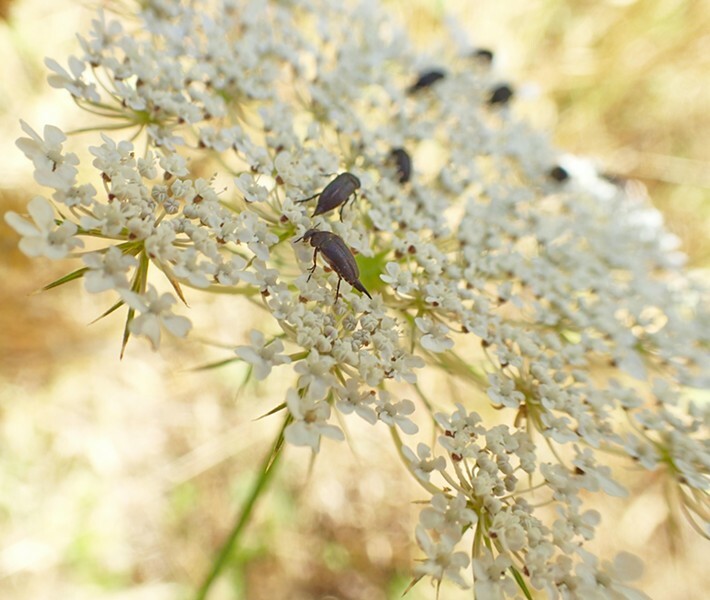 Tumbling flower beetles on Queen Anne's lace. On some nearby Queen Anne's Lace flowers I noted the black teardrop shapes of some tumbling flower beetles (family mordellidae), a species which escapes predators by making a series of tiny jumps causing it to tumble off the flower and to the ground. Although not uncommon, their wariness and this behavior makes them a challenging photographic subject. The common and distinctive 10-lined June bug on my front porch. Leaving the house for a late-night date, I noted a thumb sized striped lump on my front porch. 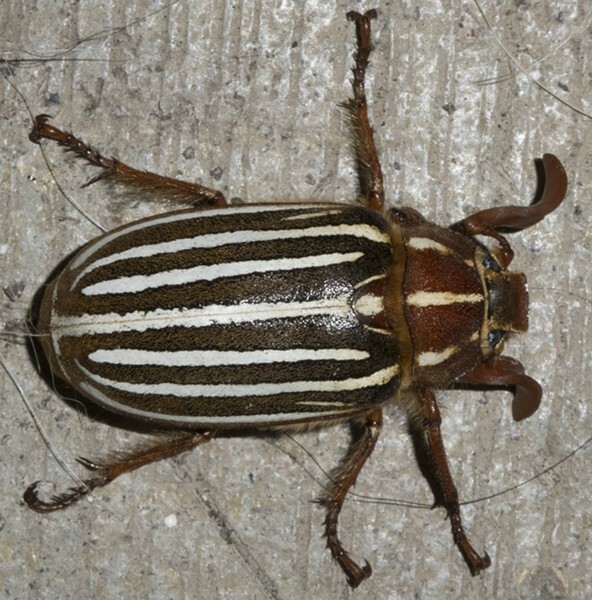 It was a 10-striped June bug (Polyphylla decemlineata). Flying to lights this large scarab is fairly common hereabouts. Until now I've never had an opportunity to photograph one. Of course I had to stop and take a few pictures. Fortunately, my wife is tolerant and kind.